Eco Flor 30, manufactured in Europe. Known for quality vinyl plank flooring at low pricing! With over 28 years experience in the 'flooring industry', Sherwood Enterprises' owner and director knows luxury vinyl plank flooring. We stock and market in Queensland lowest pricing at our warehouse showroom at Redland Bay. We stock and market known brands who have built a reputation over the years for quality, performance, durability, excellent warranties, and compliance certification to the latest flooring standards both globally and in Australia. Please view our latest website www.sherprise.com.au for glue down and loose-lay luxury vinyl planks. 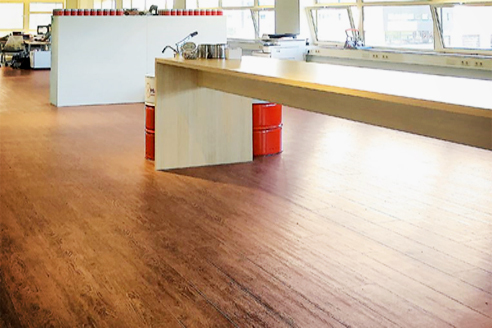 Our loose-lay plank range 4.5mm & 5mm thick, features Phthalate-free manufacturing technology ensuring VOC off-gassing to the lowest safest level with more flexibility. Polyurethane PUR thermosetting surface finishing ensuring a lifetime of weep and damp mop regime. Fibreglass reinforcement dimensional grids for superior stability and importantly a solid gripper heavy duty backing. Embossed surface with true to life wood grain visual. Loose-lay over most exiting hard level floors (contact us for more information). We also stock and market residential LT commercial usage glue down vinyl plank ranges 2mm to 2.5mm thick, just click on our latest web site, glue down vinyl planks.